Allen got his first break on a BBC talent show in 1959, and toured with the Beatles in the UK and France. He died in his sleep on Thursday night at his west London home. Comics including Eddie Izzard, Barry Cryer and Dylan Moran were among those who paid tribute to Allen's comedic talents and originality. 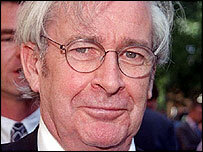 The BBC's head of comedy Jon Plowman called Allen a "wonderful comedian" who would be sadly missed. "That extraordinary relaxed style with a cigarette in one hand and a glass of whiskey in the other as he buttonholed us with wonderful jokes and stories is the image that we shall remember," he told the BBC News website. "He was a groundbreaker in many ways, particularly in the jokes and sketches that had a go at religion - something that certainly came from his growing up in Ireland that was sometimes quite tough for its day." Mr Plowman added that Allen "tried to show the hypocrisies of the world as well as its funny side". And writer Ian Davidson, who worked for 10 years with Allen, told the BBC News website: "He had so much anger, especially against the priesthood, and that was where he got his energy. He also had such a keen sense of the absurd." "He was terrific to work with - whenever we visited him the first thing on his mind was making us lunch." Mr Davidson paid tribute to Allen's ability to spin out stories on stage. "I always enjoyed the tales about how he lost part of his finger - he never told them the same way," he said, adding: "I could always tell they were lies." Allen's first UK TV series was ITV's Tonight With Dave Allen, although he had become well-known through his guest spots on BBC One's The Val Doonican Show. 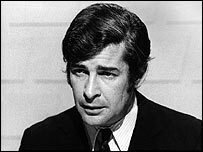 It was followed by Dave Allen At Large for the BBC, in which he developed his familiar themes of debunking religious rituals - inspired by his strict Catholic upbringing. 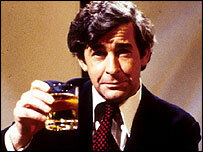 During the 1980s he moved onto an eponymous show simply featuring Allen with his trademark stool and glass of whiskey. One of his routines led to questions being asked in the House of Commons about his strong language. It led to a 1991 stage show, An Evening With Dave Allen, and a series for ITV in 1993. His last performance came in 1999, when he recorded a rare interview for BBC Radio 4. He remained protective of his material, refusing to allow it to be rebroadcast while he was alive. Offers of work had continued to come in, and he was considering a project scheduled for later this year when he died.